Hi friends! 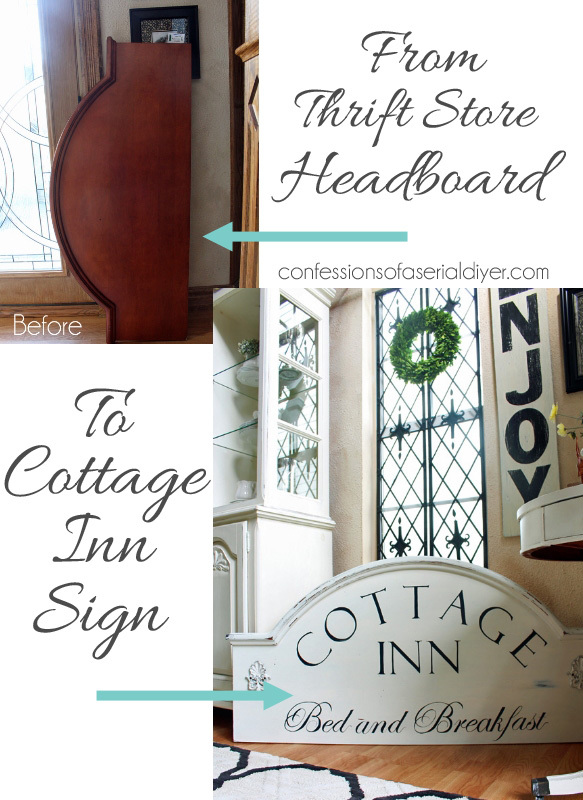 Today I’m sharing a sign I made out of a thrift store headboard. 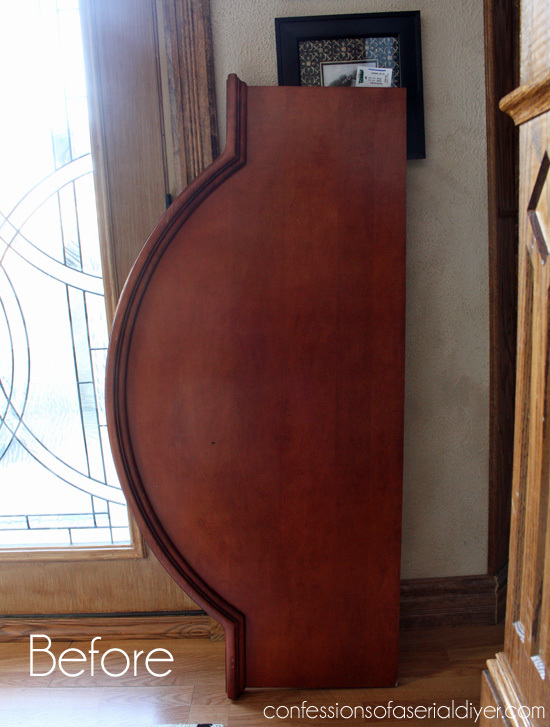 The very best part is this headboard was only $3.49!! Score! They had about ten of them, probably donated by a nearby hotel that was doing some updating. I added hooks to this one to give it a purpose, but because I took this photo in my garden, people kept thinking it was a sign made for my garden! I thought it would be lovely just inside the door as a place to hang your coat. It sold at my last show. I didn’t add hooks to this new version. With its shape, I imagine it hanging above a sideboard or above a bed, or even above a mantle. I wish I had a place for it. This will be heading to my booth. 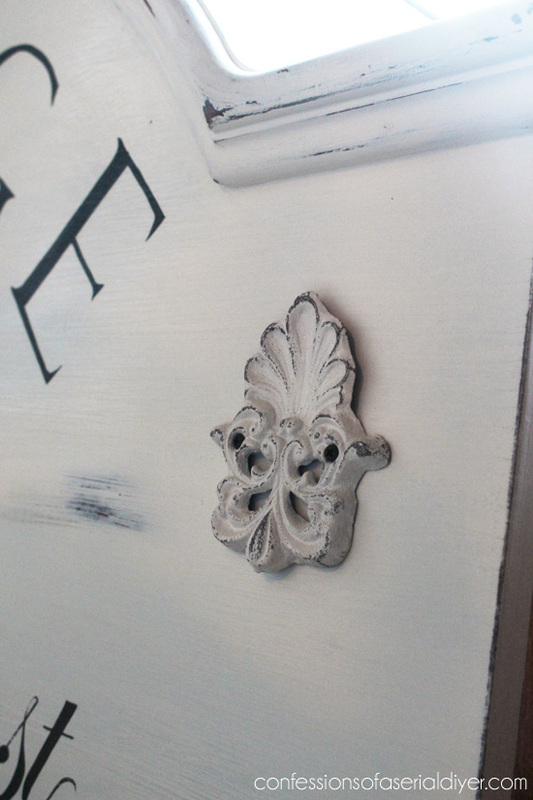 I painted it in Annie Sloan’s graphite first since it was such a reddish stain. The paint was like sludge when I opened it, but I just kept adding water and mixing and it came right back. I almost threw it out! 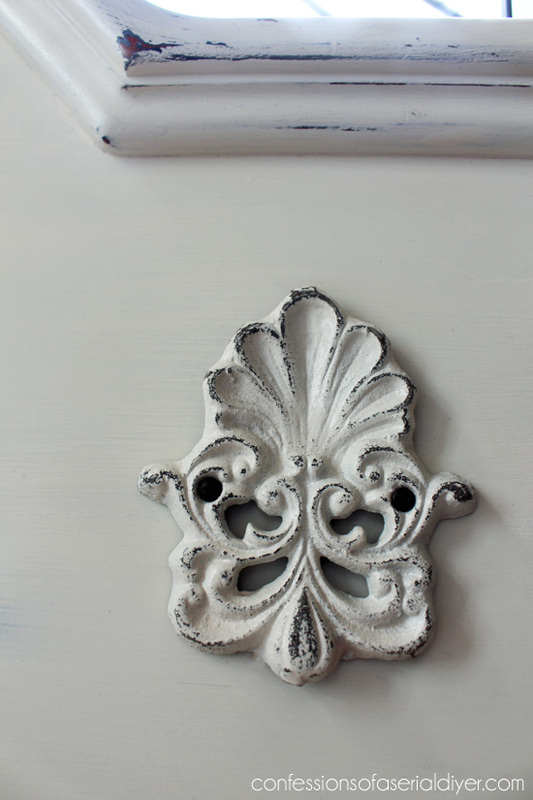 Then I painted it in DIY chalk paint in Cottage White (fitting). 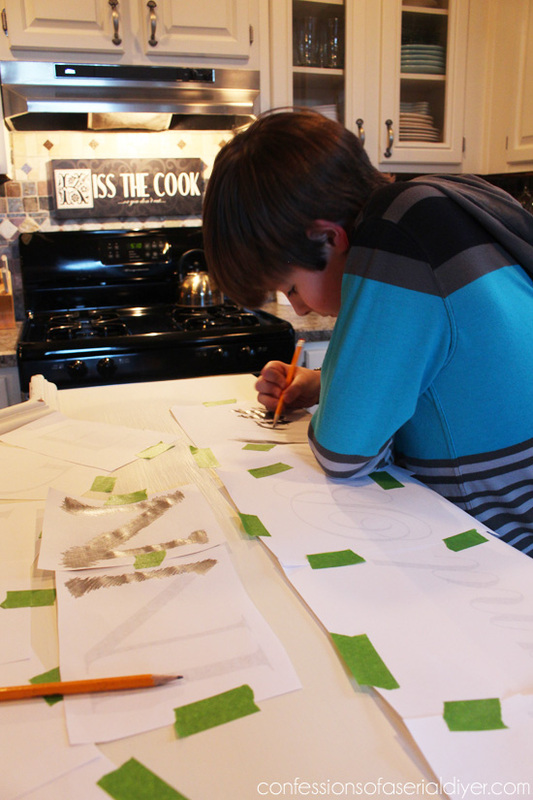 I used the transfer method I use most to transfer the letters, except this time I had a helper! He really wanted to help. Not sure he’ll speak up so fast next time ha ha! 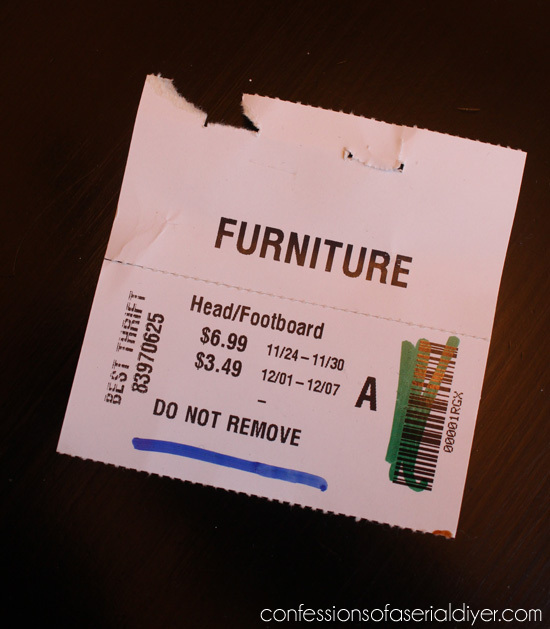 Here’s the tag…I love this place because if the items hang around long enough, the price drops and you know exactly when it will happen! This was hanging around a long time. 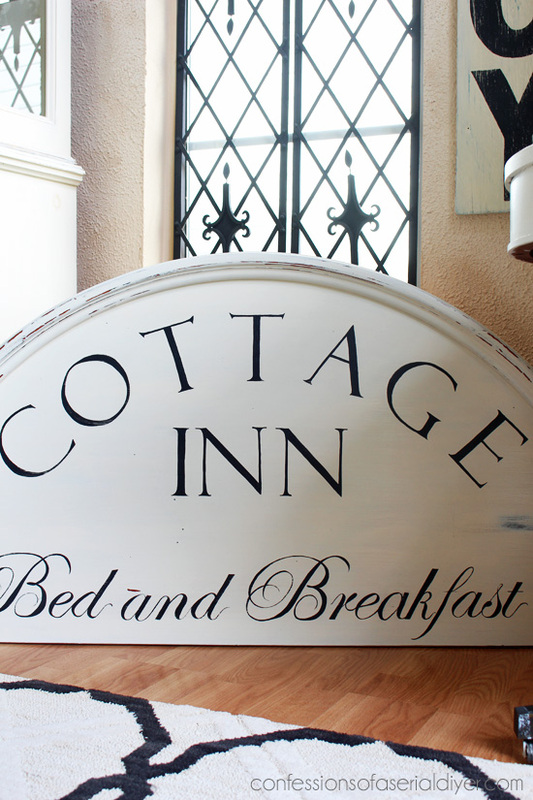 “The Cottage Inn” is Felix Titling font and “Bed and Breakfast” is done in Edwardian Script font. I went back and picked up two more just like it. Maybe I’ll try something different with those. Any ideas?? Wowsie!!!! I love this. What a great score on the price. Super cute. I always enjoy viewing your latest project. They are lovely and generate ideas, maybe someday I might even make something! 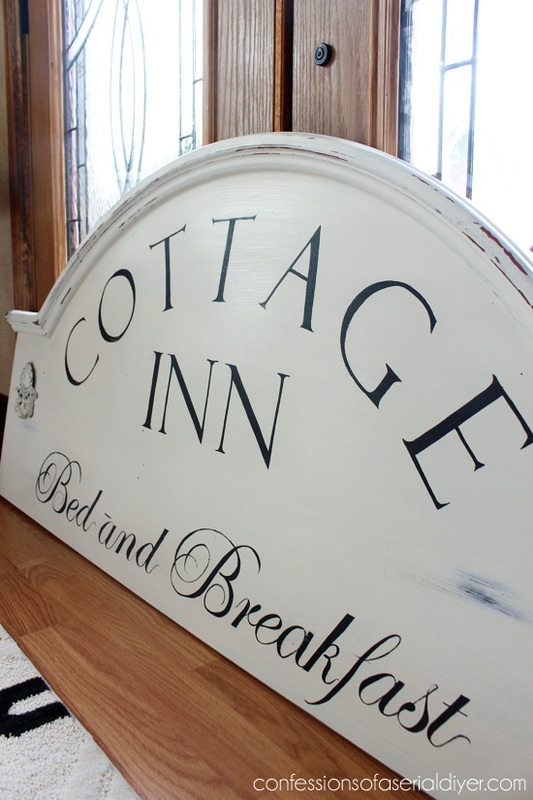 The headboard would look great as the back of a bench. Thanks for the inspiration. Another great makeover Christy!! You have a great weekend too!!! That is genius! I never would have thought of that. So creative! 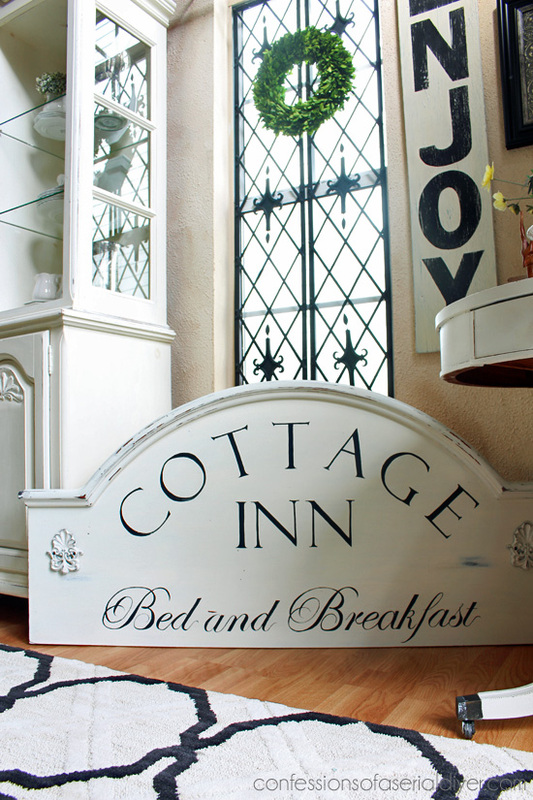 First off….what an amazing price for the headboard! Great job. 2nd …it turned out beautifully! This is beautiful! Excellent find:) that’s great your son helped out with it….makes it even more special…that’ll be a special memory later down the road:) Thanks for sharing! Absolutely fabulous and how can you say no to that price? It’s awesome, I’m pinning it! Love it! I remember the one you made last year and I have to confess I am one of those who thought it was a sign for your yard too. I don’t blame you for going back to pick up more – $3.49!!! Those would sell for around $25.00 at our local thrift stores. 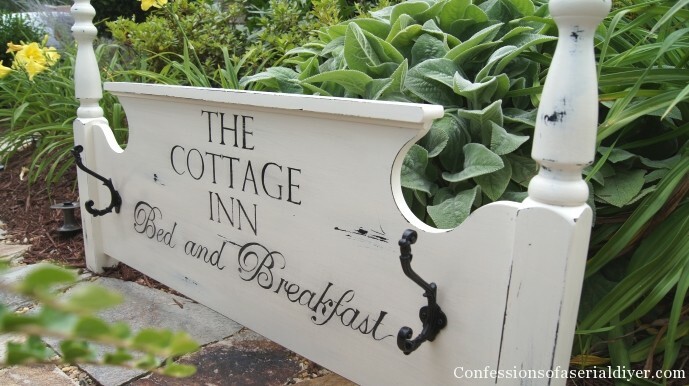 What about a chalkboard sign for over a coffee bar or buffet? What a transformation! So boring and brown and now it’s a beauty! Great job my dear! Love it! Quite an imagination. Good for you! This is fantastic! What a great way to reimagine furniture. I didn’t read the other post but I was thinking turn one of those headboards into a cafe or coffee bar sign and put knobs, hooks etc. to hang mugs on . Hang over buffet and transform into coffee bar. Love your sign. Your style is to die for!!! I am a sucker for all things white – so it is pure eye candy here! Thanks for the inspiration. This is so fantastic! I always see old headboards and walk right by. I won’t anymore! Thanks for the great inspiration! I love it soooo much Christy!!! And guess what’s sitting in our garage and I’ve tried to sell it multiple times and can’t get rid of it??? 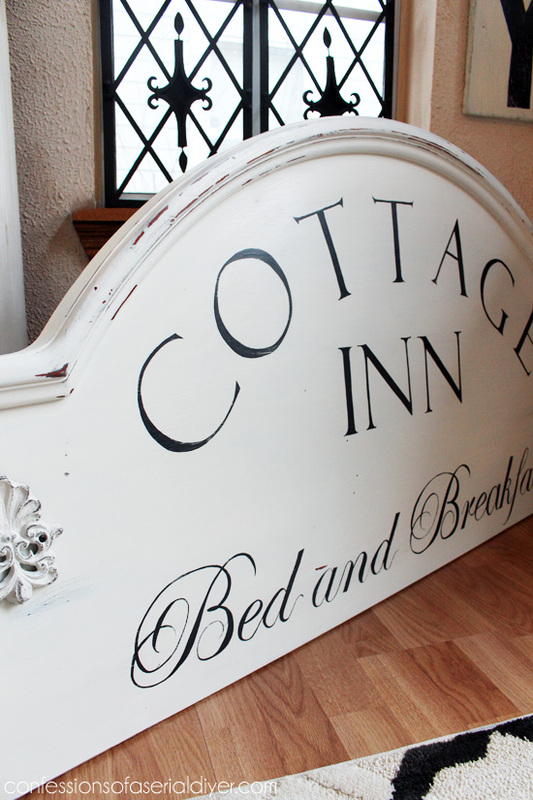 A hotel headboard! I am soo doing this… Thanks for adding the links on how to transfer the wording on! Have a great week! Christy this is BRILLIANT!!! I love this idea and the price for the piece can’t be beat! I would so buy that if I lived close to you. I have vaulted ceilings in my living/dining area and that would look so good. Darn it anyway! Great score & Great repurpose! This baby is going to sell fast! This is beautiful! I have another transfer technique for you to try……trace your letters onto tissue paper (I use pencil). Then position your tissue paper where you want it and trace again, using a fine or ultra fine Sharpie marker. The marker bleeds through the tissue leaving lines to paint. OMG that is great. Found you on Hometalk and I’m excited to sign up for your newsletters and see all of your other clever creations. Wow – you are one of those fortunate people who can the treasure through the trash! This is so cute. I’ll be featuring your project at The Scoop on Monday night. Thank you for linking up! Thanks, Suzan! 🙂 This was a rare find for our area too, and yesterday I went by the thrift store where I purchased this and they still had about 8 of them!! What a beautiful sign. Where are you using this? I love how the letters look. I have never tried using transfer, is it difficult? and you ‘hand paint’ the letters? they are so perfect…. 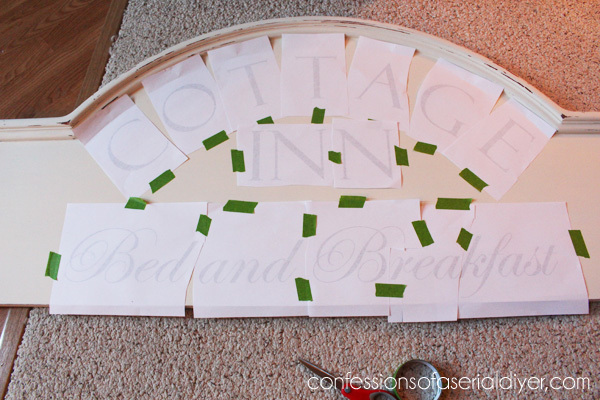 Another idea for the headboards. Tie dried roses bundles tied with satin ribbon onto one or two of the knobs/pulls. I can even send a picture of the one I did. Hi! Love love this project! I was wondering , how did you attach the metal accessories to it? I have a similar one that fell and the hook broke off. They are heavy little things and I didn’t see screws in the screw holes. Did I miss them or did you use some kind of glue?